Officials with San Bernardino National Forest today issued a new forest order modifying the Valley Fire Closure Area. The announcement on the Forest Service website, effective Wednesday, August 15, 2018, reopens a portion of the San Gorgonio Wilderness, but keeps trails closer to the burn area closed. The closed area includes the following trails: San Bernardino Peak, Forsee Creek, Momyer trace trail to San Bernardino Peak, as well as the ridgeline from San Bernardino Peak to Dollar Lake Saddle. Refer to the revised closure map. As of Aug 14th, the fire containment is at 82%, but continues to smolder. We recommend that you be aware of conditions around the mountains at anytime regardless of the Valley Fire. If conditions become threatening, please take your safety into first consideration: the mountain will be there later – keep yourself safe so you can enjoy it. As before, residents and visitors to the area may continue to see smoke for the coming weeks. Hikers with questions about the closure can call the Mill Creek Visitor Center at 909-382-2882, Thursdays through Mondays. To keep updated on the Valley Fire, check Inciweb, the forest service Twitter account and the Valley Fire Updates Facebook group. Mill Creek Visitor Center will resume processing permit requests for the reopened areas when we reopen on Thursday the 16th. The Permit request forms are in the process of being reactivated and will be available shortly. – Highway 38 has reopened in both directions. Please use caution as firefighting aircraft and equipment may be working in the area. Additionally, Caltrans will have intermittent traffic stops to complete storm related rock / debris removal along Highway 38 . – All hiking trails accessing the San Gorgonio Wilderness Area continue to be closed. Brush fire has erupted near Highway 38 and Valley of the Falls Dr. At 3PM the burn area was estimated to be between 50 and 100 acres and is heading uphill at a fast rate and has a potential to threaten the San Gorgonio Wilderness area. 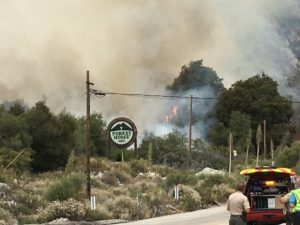 San Bernardino National Forest Service has issued mandatory evacuations for the trail areas of Momyer and Vivian Creek as well as the day use areas in Forest Falls. Highway 38 is currently closed between Bryant St (next to Mill Creek Visitor Center) and Angeles Oaks. Accessibility to the mountains will not be possible from Highway 38 until it is reopened. We will be trying to contact everyone with permits for these areas to advise against trying to enter the area. San Bernardino Peak trail was not included in the evacuation, but we are also advising against entering that area due to the increasing danger at this time. Camps are getting crowded and filling up. Be sure to plan your trip well in advance, especially if you plan to go on the weekends. If you need help, please call the Mill Creek Visitor Center at 909-382-2882.